With nearly nine out of ten board directors and C-level leaders saying that they lack confidence in their organization’s level of cybersecurity and cyber attacks and data breaches are of grave concern, it’s time to realize that most organizations are looking at cybersecurity through the wrong lens. It’s time to shift the approach from a functional to strategic. Does your organization have a comprehensive list of cyber risks that is informed by your strategic objectives? Has your organization identified the necessary security capabilities to support your strategic objectives? Does your organization have the situation awareness and culture to build resilience? CISOs, CSOs and other security executives play a pivotal role in arming their boards with the knowledge and objectivity they need to understand the risks and to inform their strategic guidance and decision making. The ability to achieve business goals and objectives is tied to effectively managing cybersecurity risk and must be prepared to take an aggressive role in ensuring the connection of cybersecurity to business strategy. Doug Grindstaff SVP of Cybersecurity Solutions CMMI® Institute and Tom Conkle Cybersecurity Engineer/Commercial Lead G2, Inc. 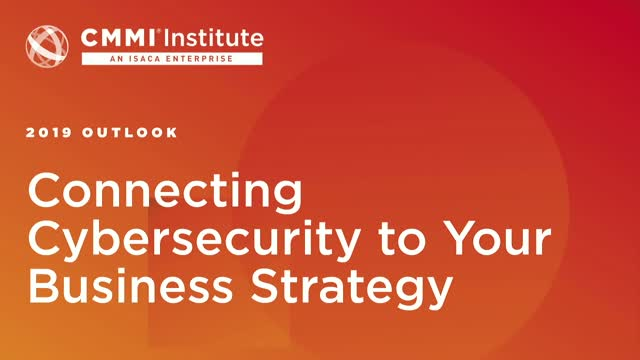 In this webinar cyber security industry experts Tom Conkle, Cybersecurity Engineer / Commercial Lead at G2, Inc. and Doug Grindstaff, CMMI Senior Vice President of Cyber Security Solutions, will delve into this perplexing board-level concern and offer actionable insights for empowering your team to build Board confidence with effective cybersecurity. By reframing the Cybersecurity discussion into a context that your Board will understand, CISOs, CSOs and other high-level IT leaders have an unprecedented opportunity to build both stronger partnerships and greater enterprise resilience. Cybercrime is rising exponentially. And taking a cold, hard, continual look at your organization’s capabilities is mission-critical. Not surprisingly, an astonishing 87 percent of board directors and C-level executives lack confidence in their company’s cybersecurity posture. 1. Moving cybersecurity from a task-oriented approach a strategic imperative – by tying cybersecurity to business strategy and best practices to build resiliency and board confidence. 2. Creating a more flexible, dynamic approach and environment – that enables you to cut across department silos and align employee awareness training, legal examination of vendors and third-party contracts, and compliance with the fast-changing rules on digital privacy and data breaches. 3. Gain the skills and capabilities to focus on what matters to your organization – from filling the cybersecurity talent gap to building risk-based capabilities that align with our firm’s strategic imperatives and give your board the knowledge to confidently guide, support and fund strategic cybersecurity operations. The risks are high and time is of the essence. Join us for this webinar and take your next steps toward organizational readiness and cybermaturity. The world’s first cyber capability maturity management platform. Cybersecurity is the #1 corporate governance challenge today — yet 87 percent of C-suite professionals and board members lack confidence in their company’s cybersecurity capabilities. Many CISOs and CSOs focus on implementing standards and frameworks, but what good is compliance if it doesn’t improve your overall cybersecurity resilience? The CMMI Cybermaturity Platform provides a risk-based approach to measuring and managing security risks in the context of your business mission and strategy. The cloud-hosted CMMI Cybermaturity Platform offers biannual updates to keep you ahead of best practices — and rapidly advancing cyberthreats. The Cybermaturity Platform harmonizes with and helps identify gaps in the implementation of leading frameworks, including COBIT 5, ISO027001, NIST (CSF, 800-53, 800-171, 800-30), DHS C2M2 and ISC^2.